Hi all! Sorry I’ve been MIA lately, I’ve been so wrapped up with work and the house build lately. That being said, today’s post is a fun one and I hope you enjoy! Today’s post is dedicated to… statement sleeves! I find statement sleeves an easy way to bring a little variety to your wardrobe. They can add a unique feature to an otherwise basic outfit, and elevate something casual to something a little more interesting. You’re also not adding something to your outfit that you wouldn’t otherwise have and so if you’re a top, jeans and go kinda gal this is for you! An easy way to add a little drama to your sleeve is to opt for a trumpet sleeve. The one linked above is very loose and flowy, but adds a hint of fun to an otherwise pretty basic weekend top. The next top also incorporates a flared sleeve but also adds an off-the-shoulder feature. It’s a little bit more showy but still a very wearable look. This top features crochet detailing down the sleeves to add a bit of interest to an otherwise basic chiffon blouse. It also makes the top look more expensive than it is. This next blouse also has that detailing down the sleeves but it is also repeated over the chest area and includes elasticated cuffs. It takes it a step further than the top previous top. This blouse has stunning frills at the shoulder and elbow, but remains pretty tailored overall. 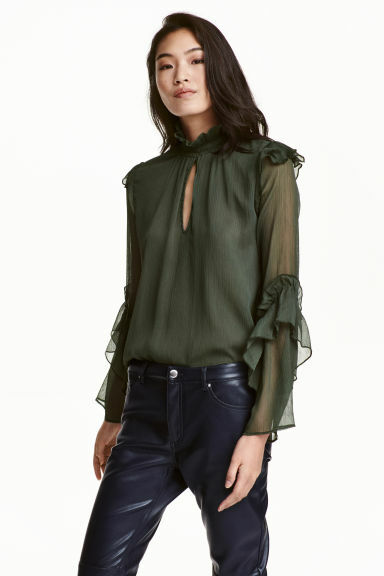 I think this blouse is super interesting but not over the top by any means. Large trumpet sleeves, gathered material and bows at the back of this top add interest from behind. It’s a very flowy top which makes it seem more easy going and easier to pull off. This top goes a step further than the more tailored one featured above it. There are frills at the elbow once more, but the sleeves are more accentuated and there is also a dropped peplum waist. This top would work great at a holiday party or something a little more fancy. Not only is it asymmetric, but it’s metallic and that sleeve definitely makes a statement. Pass the bubbly!